Segway x2 - fun and promotion: vehicle renting for unique private and corporate events, driving lessons, great plane for your mobile advertisement. Segway® is (in short) a traveling device which you operate standing straight with your body movements, fully controlling direction of the motion. By means of this leg extension a driver can go along even bumpy surfaces thanks to the fact that both wheels fastened on one axle can keep the balance. Inventor of this one of the most unusual vehicles in the world, American Dean Kamen, who earlier invented such useful things as a syringe for diabetics dozing the insulin on the basis of the preliminary set organism requirement or a portable dialysis device, kept the results of his works in deep secret for a long time. In the result at the end of the last century the world didn't know much about Segway®. Some thought that it was a perpetuum mobile to others it reminded of the new Rubik's cube, and there were people who thought this to be a teleportation machine. Production of Segway was possible when several Americans who used Internet to develop their businesses (Jeff Bezos from Amazon.com, Steve Jobs from Apple Computers and Paul Allaire from Xerox) invested millions of dollars in this novel idea, which looked like a cross between the short scooter and the miniature of the Roman chariot. In the course of only a few years that smallest personal means of transport found a wide implementation. Municipal services quickly learned to appreciate its mobility and maneuverability plus great visibility while patrolling the streets and parks. That's why it's been used by the police in Chicago and New York or some airports. Considering the fact that Segway® being powered by the electricity does not pollute the environment or generate any noise, this vehicle is used on golf courses and for sightseeing trips, especially because it's very durable and can overcome many obstacles. 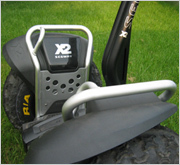 Being equipped with dynamic stabilization function, bumpers, wider and bigger tires and raised platform the cross-country model Segway® Personal Transporter X2 (second generation) was designed in such a way to unsure the possibility to enjoy the surroundings thanks to the free movement over the rocky roads, meadows and sandy beaches. There's no need to mention that driving with no exhaust fumes and noise can be very pleasant. It's a good example how the modern technologies may coexist with the necessity to protect the environment. Segway® PT X2 is economical so no wonder in big cities it's being used as an everyday means of transport. It will revolutionize the pedestrian transport in big metropolises reducing the traffic jams only when its price will go down, yet driving Segway is a great fun. Copyright ® 2006 - 2019 Segway® is a registered trademark of Segway Inc.
Any usage of it on this site is solemnly for informational purposes.